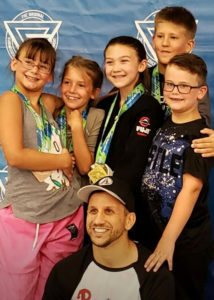 Our kids program focuses on teaching children jiu-jitsu concepts and techniques that will help them progress both on and off the mats. By instructing students in different techniques and having them work in a wide range of common situations, they are able to make educated decisions, protect themselves and make physical progress. Not all of our students compete, but our team has had great success on the competition scene. Our main program is designed for kids aged 6 and up, but we also have a Jiu Jitsu Movements class for 3-5 year olds.